No matter what your business is, you’ll need to produce vast quantities of writing. 53 percent of marketers cite creating blog content as a top marketing priority. But there are also emails to your list. Blog posts. Brochure copy. Social media updates. That’s a lot of work required every week. If you’re struggling to keep up, you may wonder if it’s time to hire a content writer. Read on to discover the 5 signs to watch out for that tell you it is time! Not all websites need blogs. But if you don’t have one already, then hiring a content writer can be the best way to get one started. Otherwise, you risk scraping around every week or month to throw something together. Blogging for the sake of blogging won’t help your business. Perhaps your website already has a blog but it hasn’t been updated in over a year. This shows you don’t see it as a priority in your already-packed schedule. A content writer can produce your blog content, freeing you up to work on other tasks. Email marketing remains a popular form of marketing. You don’t need to worry about ad-blockers like you do with banner ads. And your subscribers have already shown an interest in your product by signing up. But if you struggle to get subscribers to open your emails, then sending them becomes pointless. A content writer with experience in crafting email campaigns can craft subject lines that will compel subscribers to click. They can also write newsletters that subscribers will look forward to receiving. It all helps boost the profile of your brand. Google likes regularly updated websites because it proves the content is not out-of-date. Keeping your blog updated with fresh content is an easy way to help boost your SEO. Having more valuable posts on your blog that answer your audience’s questions also gives more potential touchpoints. And because your content can continue to be found after you’ve stopped promoting it, it’s a passive form of lead building. But getting SEO right takes time. So check a website like SEOClerks for content writers with SEO experience. It’s vital that you hire an SEO specialist if boosting website traffic is your goal. Already know that you want regular content on your site? You’re probably burst with ideas for blog posts that your community really needs. But it’s likely that writing those posts keeps falling off your to-do list every week. Other things, like having meetings, talking to leads, or working with customers, take priority. 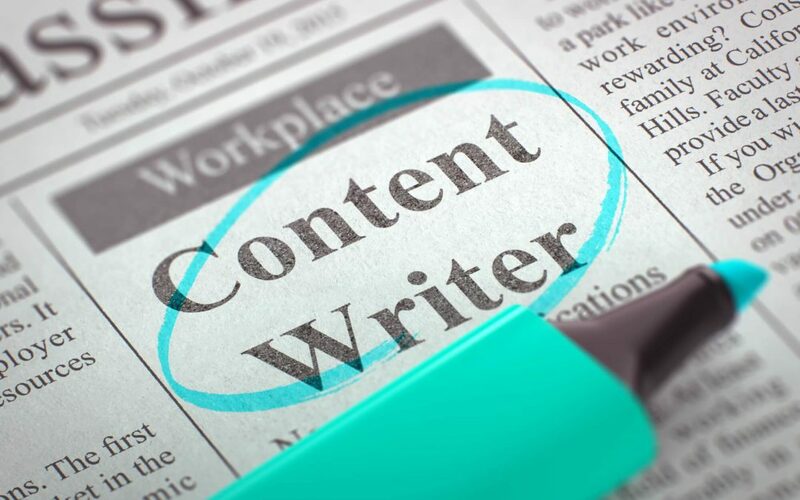 If this is you, then it’s time to hire a content writer. You can offload your ideas and even research to the writer. Then let them create the content for you. Video can be an incredibly powerful form of marketing. Using video makes it easier to engage with potential customers. People watch more than 500 million hours of video content every day on YouTube. But how do you know what to say? You could just talk about a topic off the cuff. Or you could follow a well-written script designed to touch all of the points you need to cover. If you’ve never written a script before, you could hire a content writer to do it for you. Choose one with experience in writing scripts for video marketing for the best results. Have You Realized It’s Time to Hire a Content Writer? If you’ve checked off one, or all, of these signs, then you need a content writer. They can help you expand your business, reach new audiences, and wow prospects with professional content. Still need help with SEO and digital marketing? Check out what we offer here at Full Scale SEO.